One of the reviews for this debut novel calls it a "stay-up-all-night, swashbuckling, breath-holding adventure of a novel*," and I am in complete agreement. 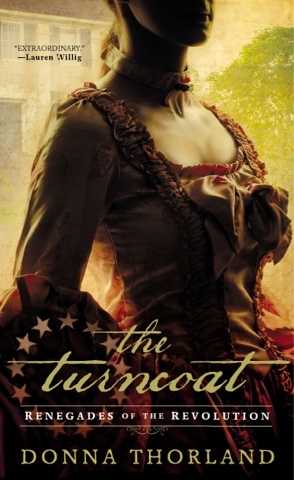 Donna Thorland's THE TURNCOAT had me staying up way past my bedtime...and I'm a woman in much need of sleep! I was quickly hooked, though, on this historical novel about a Quaker woman who becomes a spy against the British in Philadelphia during the Revolutionary War. It's a steamy romance, nail-biting spy/war novel and American-history lesson mixed into one; a guilty pleasure of a novel that one doesn't have to feel too guilty about reading! Kate Grey is a rare breed of Quaker. She has been raised by a man who is far from a pacifist--in fact, he has rebel-leanings and (secret) ties to George Washington. So, when British officer Peter Tremayne commandeers her home, Kate is not afraid to voice her dislike of his politics or his position. And soon she becomes unafraid of his amorous advances as well! But, alas, their time together is cut short. A rebel spy hatches a plot to take Tremayne out of the picture, and this so-called Merry Widow implicates Kate in the process. With Tremayne gone, Kate sees no other path but to follow the Merry Widow to Philadelphia and train as a rebel spy under her tutelage. But all is not fair in love and war. When Tremayne shows up in Philadelphia and recognizes Kate for whom she really is--and discovers that Kate is also engaged to his high-ranking cousin--they'll need to decide where their loyalties lay: to their countries or to each other. Ooooo, did you like my dramatic synopsis (it was fun to write, I admit.) Seriously, though, this book is a great read and extremely well-crafted. I loved Kate Grey as a main character. She's smart and sassy, but still gets nervous and makes mistakes, and I find that makes her much more relatable than an over-perfect heroine. The book is also very well-researched and I found the American history fascinating. I also have a soft-spot for brotherhood-at-war stories (All Quiet on the Western Front is a favorite) and this has a satisfying amount of that too. Then there's the excitement of the battle scenes and the intrigue of the espionage (with elaborate costumes!) that kept me turning the pages. And of course, we cant forget the steamy romance seems that sometimes made me blush, but which I definitely did like. Though, I'd rather be told that a man was aroused than that "his c*ck stirred." But maybe that's a historical turn of phrase... or I'm a big prude!! I'm really looking forward to the next book in Thorland's Renegades of the Revolution series. Until then, you should check out THE TURNCOAT so we can discuss--I will actually have the author herself by for a blog tour stop and a book giveaway on March 13th! Make sure you stop back then! This book was given to me for review by Penguin.